(VEN) - The Trade Office of the Vietnamese Embassy in Mexico would like to introduce a list of home decoration, gift and handicraft fairs to take place in Mexico in 2014-2015. (VEN) - By increasing the scientific and technical content of products, developing sales networks and establishing close relations with consumers, several fertilizer businesses have developed despite changes in the market and the boom of fake and substandard fertilizers. (VEN) - To take full advantage of the benefits from the Trans-Pacific Partnership Agreement (TPP) to raise more capital for material production projects, the Vietnam National Textile and Garment Group (Vinatex) has appealed to the government to allow enterprises to keep the money obtained from selling the state stakes for five years after official privatization. (VEN) - Vietnam Timber and Forest Product Association (Vifores) Vice President Nguyen Ton Quyen said that the US$6.2 billion wood product export target set for 2014 was absolutely feasible. (VEN) - The commodity production and consumption link considered as one of key models for stabilizing the price of food stuffs in Ho Chi Minh City. (VEN) - An international workshop on Vietnamese-Italian cooperation in leather and footwear is scheduled to take place on February 26 in Ho Chi Minh City as part of the program to expand cooperation and trade promotion activities between Vietnam and Italy. 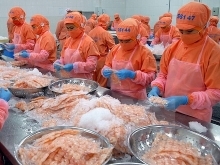 (VEN) - With high demand, low barriers, and medium high product quality requirements, Africa and Latin America are considered emerging markets for Vietnamese goods. (VEN) - Vietnam’s garment and textile industry exported materials with a total value of about US$800 million in 2012 and 2013 thanks to an appropriate investment strategy. (VEN) - Vietnam registered a trade deficit of US$100 million in January 2014, according to the Ministry of Industry and Trade (MOIT). The export prices of some kinds of goods, especially agricultural products, have considerably increased. (VEN) - The steel industry must reorganize its distribution system, improve competitiveness and promote exports to new markets to achieve growth of 6-7 percent in 2014.